My display at Patuxent will be up for the month of June. 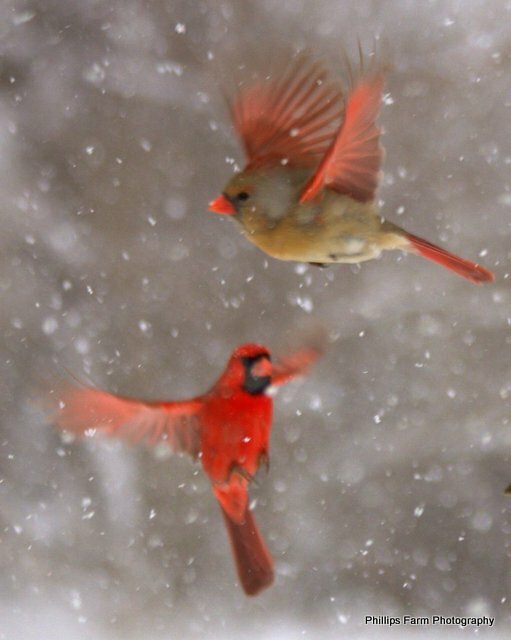 Birds in flight are featured on one panel. Here are three of the birds you will see there. 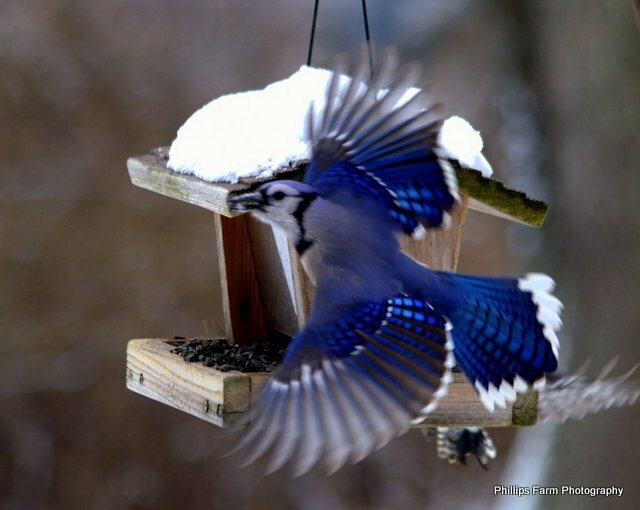 The Patuxent Wildlife Research Center located at 10901 Scarlet Tanager Loop, Laurel. Md. (just northeast of Washington DC) (240-882-0360) features an artist each month. This month I am pleased to be featured in there art gallery. I have 60 pictures on display. If you live in the area, please drop by. They have many great displays and lots of nature trails to explore. The display in on 6 panels each one has a theme, “Backyard Birds”,”Wild Ponies”, “Insects”, “Parent and Child”,”Big Wading Birds”, and “Birds in Flight”. While we were setting up the display people were walking by. The “Wild Ponies” was one of the first panels to be put up. 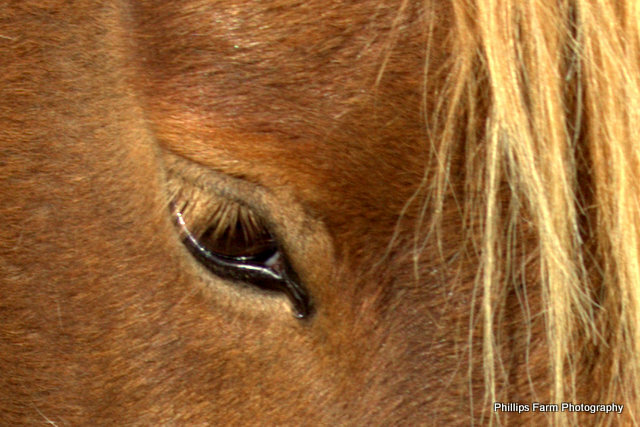 I have a picture of a pony’s eye close up. The caption reads, “Have you every looked a pony in the eye?” and I put the picture at the eye level of a first grader. Lots of the adult that walked by bent down and looked that pony right in the eye. It make me feel rewarded. 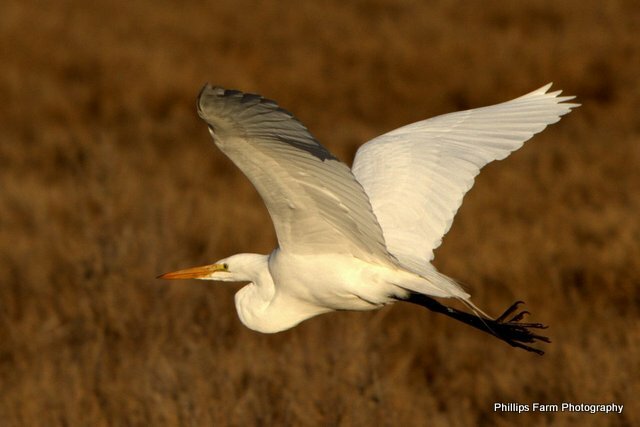 This spring I took a photo workshop with Jim Clark at the Chincoteague Bay Field Station in Virginia. Mr. Clark had us in the field most days before the sun was up and often we stayed in the field to see the sun set. He did let us have time off for food. It was a great learning experience. The wild ponies were a lot of fun to see. Once I was driving back to the Station after not being able to see any ponies and got caught in traffic jam as I was leaving the park. To my surprise the cause was a herd of ponies walking down the center of the road. Great photo op. 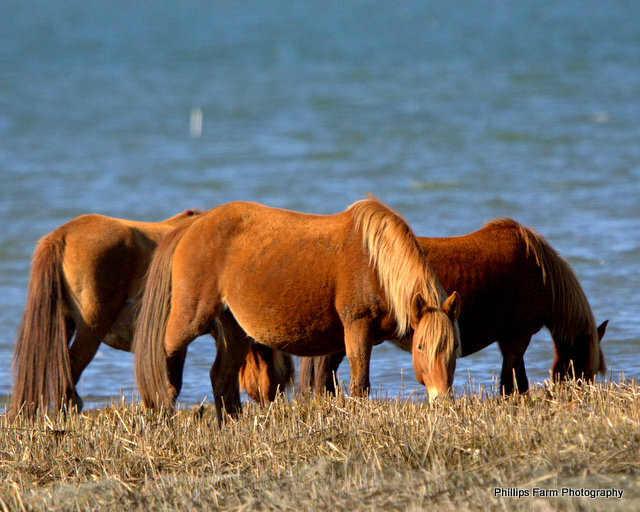 Assateague Island National Seashore near Ocean City, Md is a great place to see wild ponies. 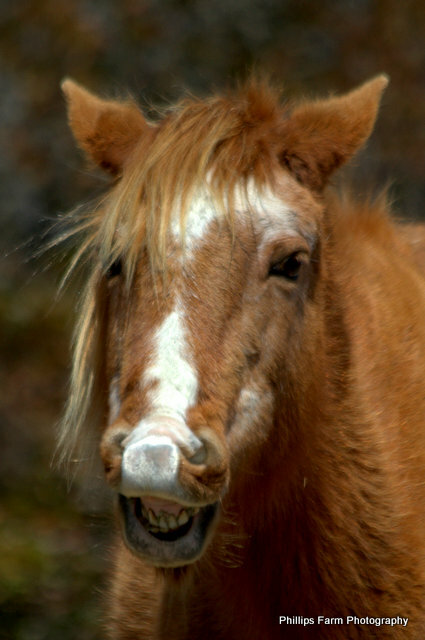 This pony reminded me of Mr. Ed the talking horse or a good case for dental care in ponies. 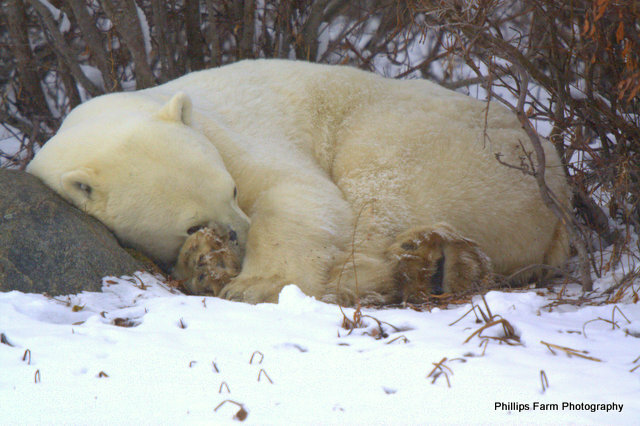 Polar bears consider you food. Not as good as a fat baby seal but food none the less. Therefore walking out to take a picture of one is not a great idea. But tundra buggies are. As big as the buggies are the bears are not afraid of them at all. I am not sure, I could sleep while they rumble by but they can. Scar nose polar bear is one we saw several times. 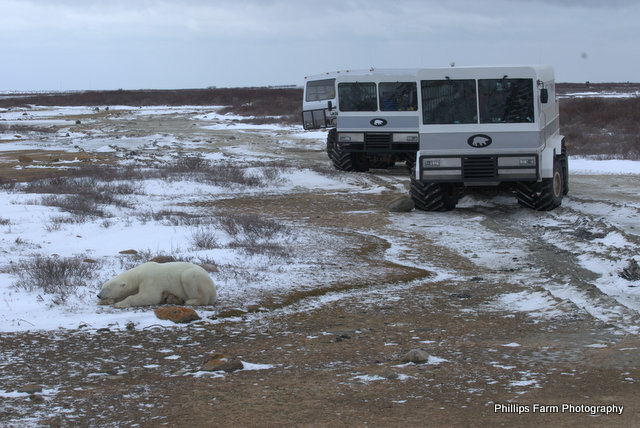 This time he does’t seem to be distracted from his sleep by the tundra buggy right beside him. Well, maybe he is keeping one eye on us. We also saw him fighting later that day. Our tundra buggy held about 30 peple, with room to walk around, and a stove in the back to keep us warm. It also had an observation deck on the back. 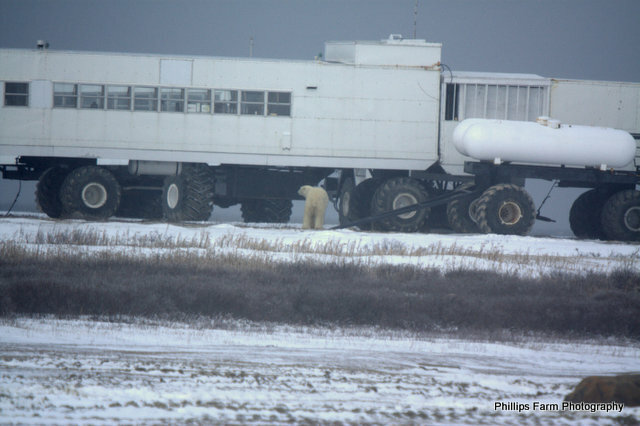 On the tundra, they also had a hotel on wheels, you could stay over night and take a buggy out during the day to see the bears. Bears are curious. They often came up to the hotel to explore around and scratch there backs on the tires.